In a fresh take on academics, children from different IGCSE schools are showing a Mumbai.keen interest in robotics workshops. As a part of their curriculum, the students are required to impart what they’ve learned to the underprivileged children from NGOs. 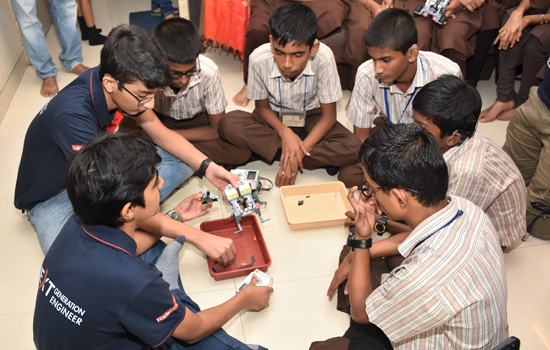 The future world being robotics centric, Team Luminosity’s ‘Hour of Robotics’ workshop, in association with JOSH Foundation, was a maiden collaboration with hopes for more such workshops, even advanced ones. Added Audiologist-Speech Therapist Devangi Dalal, “If the children like it, then there are many more to come.” Using Lego Mindstorms EV3 kits, their aim is to give back to the society all that knowledge they have acquired in their training. JOSH Foundation, an NGO for the upliftment of children battling hearing impairment, was set up by ENT Specialist Dr. Jayant Gandhi along with Devangi Dalal, with a mission to empower differently-abled children. “We are supporting them. Science helps in the overall progress and development of the child. Even the hearing impaired kids should know how robotics and machines work,” said ENT specialist Dr. Jayant Gandhi. “Balance in education and CSR activities go hand in hand. That is one aspect for them. On the other hand, the hearing impaired children have not seen robotic machines at a personal level. They’ve seen it on TV, but have themselves not done it,” averred Devangi Dalal. “Our team consists of 8 students across the age of 12-14 years and are fascinated by the world of robotics. We are going to participate in the FIRST Tech Challenge to be held in Pune this February,” stated a representative from Team Luminosity. “Our has a vision to educate and spread the knowledge to young children, the future of tomorrow,” the representative added. The workshop proved to be a success as the children gained the necessary insight in the field of robotics and machines.